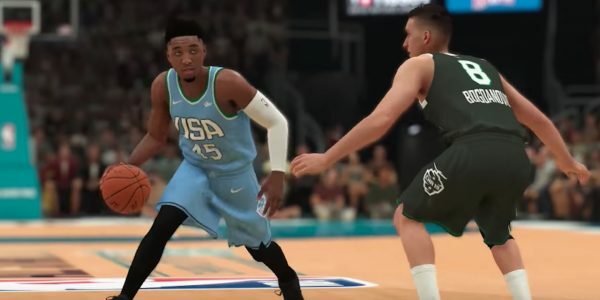 The NBA 2K19 video game features episodes of NBA 2KTV shown on-screen as gamers wait for their latest game to load. It’s also possible to watch episodes of the show related to NBA 2K basketball on the game. For a long time, it featured Rachel DeMita as a popular personality hosting the show to interview NBA stars, gamers, and other celebs. Now with the latest NBA 2KTV Episode 25, a brand new co-host has debuted. The latest show also features Donovan Mitchell and much more from All-Star Weekend 2019. Replacing former NBA 2KTV host Rachel DeMita seems like a tall task. DeMita was part of the 2KTV show since Episode 1 and remained on for nearly five years. Her departure upset a number of fans. However, brand new co-host Alexis Morgan debuted on the newly-released Season 5 Episode 25 and seems like a capable replacement. For those unfamiliar with her work, she’s far from new to the NBA. Alexis also works with the Memphis Grizzlies as a digital content reporter. In a recent interview on Twitter, she talked with CJ Miles from the Grizz. Now she’ll talk to NBA players from various teams as part of her new role with 2KTV. She posted about the excitement of her debut on the show on her Instagram. On NBA 2KTV’s newest episode, Alexis is there with Chris Manning in Buzz City. The duo was part of NBA All-Star Weekend 2019 in Charlotte to cover all sorts of topics. They ranged from talking to players there for the events to taking a look at what was going down around Charlotte for the weekend. In addition, Ep. 25 features coverage of new aspects of the 2K19 game. During her debut, Alexis spoke to the 2018 NBA Slam Dunk Champion Donovan Mitchell. The Utah Jazz star talked about being in the 2019 NBA Rising Stars game and how the All-Star experience compared to last year. Alexis was impressed with Mitchell’s five steals in the game as the defense isn’t necessarily emphasized in those sorts of contests. During the sit-down interview with Mitchell, Alexis asked him about interesting aspects of his playable self in 2K. Morgan mentioned that last year, the Jazz star was on a campaign to get his in-game dunk rating higher. It’s up to a 97 on his NBA 2K19 player ratings. He said he believes he can keep at it and get it up to a 99. It wouldn’t be NBA 2KTV without asking Mitchell about his own NBA 2K19 gaming. He is an avid gamer when it comes to 2K and said he enjoys playing MyPark and MyGM modes the most on the game. You can watch more cool features on NBA 2KTV Episode 25 below. Alexis Morgan seems like she’ll do just fine as the new co-host for NBA 2KTV. Here’s wishing her the best in this new role as she helps provide more great interviews and content for the NBA 2K19 game’s TV show! Get more of the latest information, news, and tips about the NBA 2K19 game here.